Some of my favorite polishes have come from previous Sally Hansen Designer Collections, so I always get excited when I know a new one's coming out. I was giddy when I found fall's at Bed Bath & Beyond last month and my photos wound up on Nouveau Cheap. Love that feeling! Thanks, G! [She called me her pal. Eeeee!] I almost bought a couple from the collection right then and there out of excitement, but I kept my cool and reminded myself that I can get a much better price at CVS. I've got CVS savings down to a science. When I finally happened upon the collection there over the weekend there was no more holding myself back! I spent a long time looking at each shade and came away with two...so far. The collaborating designers this time around are Tracy Reese and Prabal Gurung again, but the two shades I picked aren't associated with either. Ever Green is a dark green cream. This week has really restored my love for Sally Hansen! Yesterday I was reveling in a new Xtreme Wear glitter with a decent base and...well... Just look at this beauty. 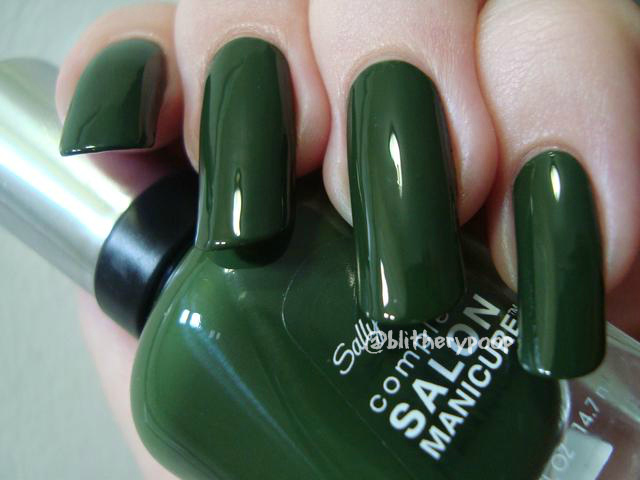 After a few very iffy experiences with new core Complete Salon Manicure core shades (click, click, and click) my faith in this line was wavering too. 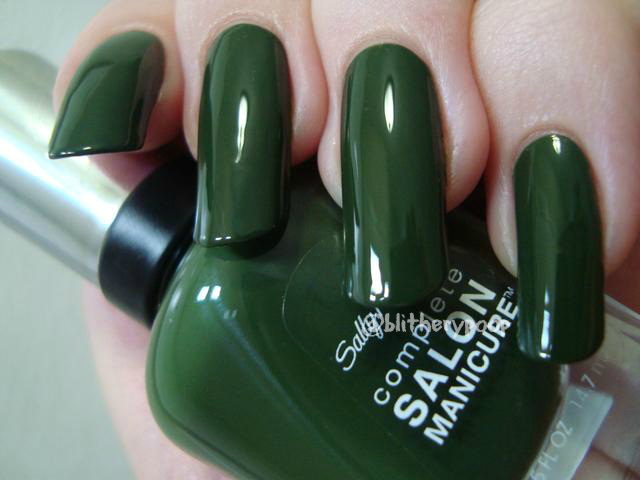 Ever Green is perfection though. Such a relief! This is two coats, though one thicker coat would probably work well for some. It applied wonderfully...and this color! Mmmm! 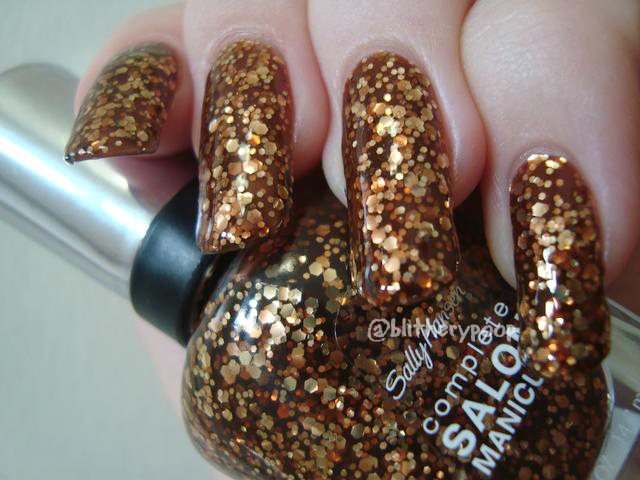 Golden Rust has small and large gold hexagonal glitter in an umber colored jelly base. 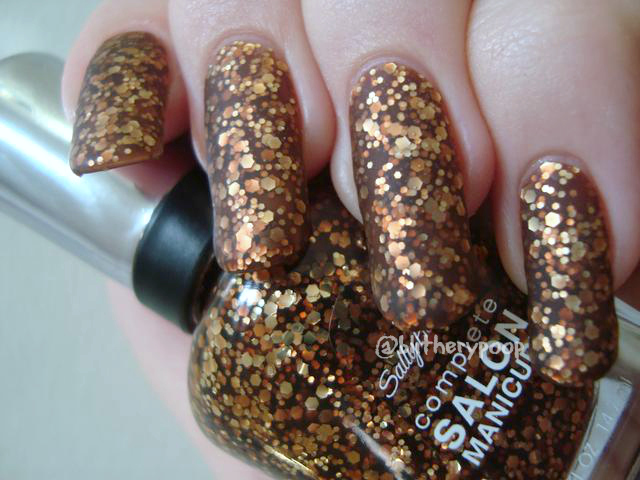 This is one of those polishes that is so much prettier on the nail than in the bottle. Perfect for fall too. The jelly base is sheer, but two coats contain enough glitter to provide decent enough coverage. I did do a little bit of dabbing to even out the glitter placement, but it mostly goes where you want it as you brush it on. 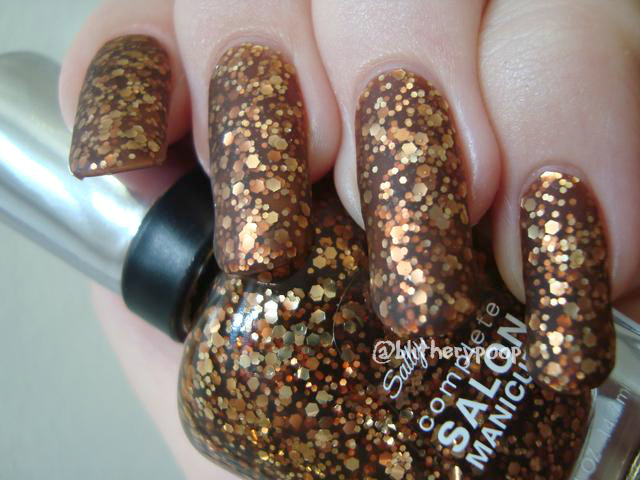 That's vital in polishes like this and I'm really pleased with the formula here too. It took an average amount of topcoat to smooth out. I almost didn't mattify Golden Rust, because it was getting kind of late by the time I swatched it, but I'm glad I did! I'm even gonna post a second picture because the depth of this polish deserves two. I like it glossy, but I love it matte! 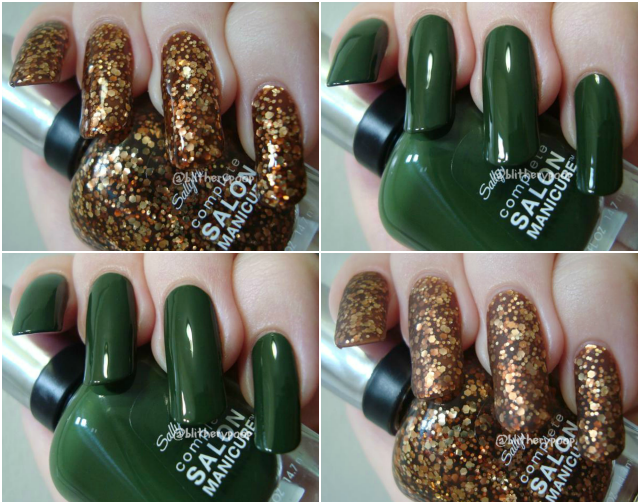 Bottom line: Golden Rust is unique in my collection and Ever Green is a wonderful green with an outstanding formula. Hooray! I'm probably not done with this collection yet. If I do wind up buying more of them it'll probably be Somber Bliss and Dark Knight...and maybe Rupee Red and Shattered Stars too. Time will tell. NYFW starts today, with a look ahead to Spring '15, and I'll be keeping an eye out for sneak peeks of the next Designer Collection. If this time is like the last couple of years, they'll be on the runways and then on twitter...and then on my Upcoming Collections board on Pinterest.